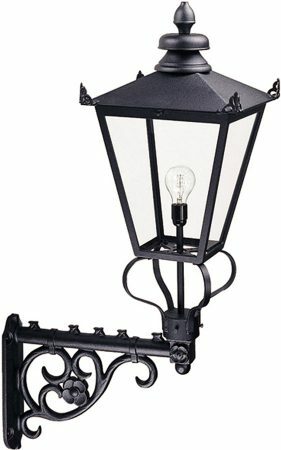 This Elstead Wilmslow 1 light large outdoor wall lantern in black with Victorian style is rated IP23 and made in England. A large wall light, with a heavy ornate wall bracket featuring scroll detail and sprung mounts supporting a gaslight style tapered lantern, with open bottom, clear glass panels, sloped roof and corner finials. A corner bracket is available to mount this wall light on the corner of a building, please see the EL-C/BKT4. Manufactured from chromate treated cast aluminium and supplied with a three-year warranty against corrosion, this imposing wall mounted lantern stands 115cm tall and features a replica gas lantern for an authentic period look. Just one glance of this lighting range shouts quality and attention to detail. Please note: All products in the Wilmslow exterior lighting range are assembled and hand finished to order. Please allow 5 – 7 working days for your order to be delivered. There are matching fittings in the Wilmslow Victorian style outdoor lighting range; please see below. This exterior light is supplied by Elstead Lighting, a British company that specialise in the manufacture and distribution of quality decorative lighting such as the Wilmslow 1 light large outdoor wall lantern in black with Victorian style and rated IP23 you see here.